This book is beautifully illustrated and packed with information on medicinal purpose, growing and harvesting, recipes, and the roots of tradition. Step into a world of spiritual rejuvenation and radiant health with the restorative power of herbs. 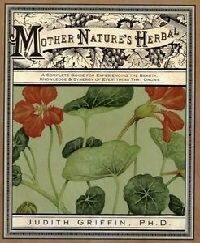 Brimming with herbal folklore, tips for growing and harvesting your own herbs, and over two hundred medicinal and culinary recipes from diverse cultures, Mother Nature's Herbal will become your trusted companion on the path to natural living. Take a tour of the time-honored traditions and healing practices of cultures past and present, including Native and South American, Mediterranean, East Asian, and others. Create delicious and exotic entrees, brew soothing herbal teas, mix perfumes and salves using flower essences from your backyard garden, prepare elixirs and medicines to treat every ailment-and so much more.